In 2014, I posted a series of Birth Announcements pulled from real births in real hospitals around America. We explored the most common middle names for boys earlier this week. Similarly, I also collected together the twenty most common middle names for girls. Disclaimer: This is very limited data. The following featured names appeared the most often in my small collection of birth announcements which can be found on the name lists page. Of course, I would much rather have official data. If the Social Security Administration made a list of the most popular middle names, things would be easier and namers across the country would rejoice. Since they don't seem to compile that data, I had to come up with my own. What I noticed is that many of these names are fairly traditional. Not quite to the same extent as the male options, but the females may also receive names that honor a relative or an ideal such as grace or faith. This list will probably not come as a surprise to those familiar with names. Many of you might also refer to these names as "filler" names since they are often considered too common. Some may even feel that these names lack creativity when compared to other trendy, unexpected middle names that are available. But then again, these middle names are popular for a reason. They are mostly timeless classics that flow very well with a variety of first names and surnames. When they also happen to honor relatives, they surely deserve to be considered as more than just "filler" names. 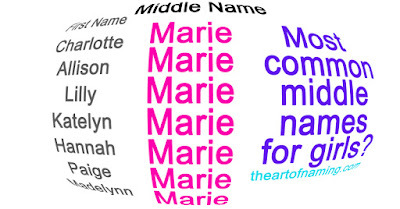 (32 uses) Marie is the French form of Maria and Mary, both of which come from the biblical Greek names Mariam or Miryam. The meaning of these names isn't set in stone, but typically it is either "sea of bitterness" (or just "bitter"), "rebelliousness" or "wished for child". It could have also originally come from an Egyptian name derived partially from the letters mry meaning "beloved" or mr meaning "love". Thanks to the biblical Virgin Mary, these names are incredibly popular with Christians. There have been Queens named both Mary and Marie. 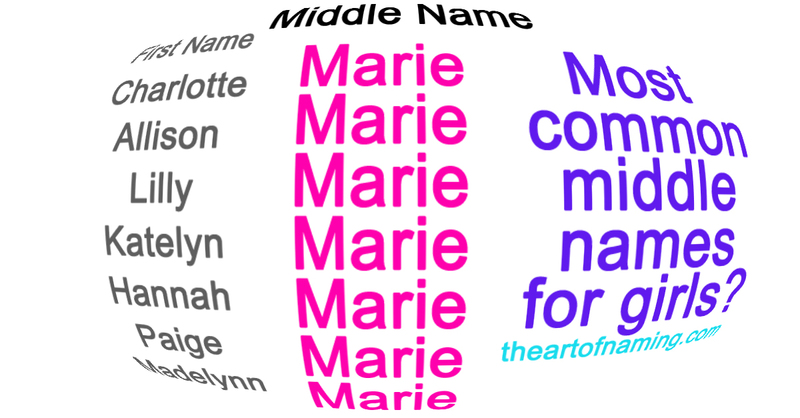 While Mary has been the longest reigning female name, Marie very much feels like one of the most popular middle names ever. On this limited list, it ranks as #1. It was most used as a first name in 1920 with a rank of #13, but in 2014, Marie only ranks at #579. (31 uses) Not just a lovely flower, Rose was originally the Norman form of a Germanic name. The elements hrod meaning "fame" and heid meaning "kind, sort, or type" went into the name Rose first in the Ancient German forms of Hrodohaidis and Rothaid then later as Roese and Rohese which were introduced by the Normans to England. It became associated with the word for the flower which was derived from the Latin rosa. In other languages internationally you get names like Rosette, Rosine, Rosalija, Rosalie, Róisín, Ružica, Rosella, Rosália, Ruža and Raisa. Lovely, fragrant, international, versatile. Great as a middle name and so common today. As a first name, though, it peaked in 1915 through the 1960s. In 2014, it ranks down at #194 and would be more unexpected as a first name than as a middle. (18 uses) Let's break this name down in order starting at the origin. The Hebrew name Channah means "favour" or "grace". It leads to the names Hannah and Anna which seem to have been more interchangeable in the past than they'd be considered today. From Anna came the French form Anne which was also spelled Ann. Both were imported to England in the 13th century and were well-used in the Middle Ages. There have been English Queens by the name of Anne. This name works well in a variety of forms and languages and also as a suffix to certain names. Related names include Annette, Nancy, Hanna, Anaïs, Annabella, Annushka, Anica and more. Overtime, Ann was much more popular, peaking in 1957 at #44. Anne held her own and ended up surpassing Ann in popularity lately, ranking at #553 in 2014 while Ann ranks at #945. (18 uses) Lynn comes from an English surname derived from the Welsh element llyn which means "lake". Originally this name was used for males, especially before the start of the 20th century, but over time it became common for females instead. This is possibly because of the influence of the name Linda when it was mega-popular. And of course there are plenty of names now that are fashionable with -Lyn, -Lynn or -Line as the ending. Lynn is a common middle name for girls these days. As a first name, Lynn had a major popularity peak in 1956 but was not all that popular before or afterward for girls. It fell out of the Top 1000 in 1997 and there were only 87 girls named Lynn in 2014 (and also 16 males). (16 uses) First of all, Mae is a form of May. Secondly, there are many possibly origins for these names. It could be inspired by the month of May which comes from Maia, the name of a Roman goddess. It could be inspired by the name of the hawthorn flower. Or it could simply be a short form, nickname for or diminutive of names like Mary, Margaret or Mabel. Many times May comes from Mary. On their own, though, May and Mae do stand tall as solid first names. Mae is actually the more popular spelling. It peaked in 1918 as a first name with 2,756 births for the year. In 2014, Mae ranked at #682 with 412 births, and May only had 136 births for a rank of #1581. As a middle name, these both seem to be quite popular. (13 uses) Elizabeth is a classic, go-to name for girls. The most evergreen of them all as a first, and very common as a middle name too. It comes from the Greek Elisabet which was derived from the Hebrew name Elisheva meaning "my God is an oath". There have been two Queen Elizabeths, including the current long-reigning Queen of England. There was a 12th century Saint Elizabeth of Hungary who was often honored in medieval England through the Spanish variant Isabel. Elizabeth works very well internationally and has spawned so many names and nicknames like Elise, Isabella, Lillian and more. There have always been thousands of Elizabeths born every year and it has always ranked within the Top 30. In 2014, Elizabeth was #14. Would you use this name as a first or a middle? (11 uses) The name and the word Grace come from the Latin gratia. It is one of the many virtue names that were first used by Puritans in the 17th century. It seems to be a very popular middle name for girls these days. As a first name, it first peaked in 1918 before declining in usage a bit. It has always ranked within the Top 400 since 1880, though. Since around the early 1990s, it caught on again with modern parents and was revived well for a popularity high of #13 in 2003 and 2004. Since then it's fallen back down to #21 in 2014. It's hard to tell, but it seems to be more favored in the middle rather than as a first name. What's your experience? (9 uses) Like Grace, Faith is another Puritan virtue name from the 17th century. This one comes from the Latin word fidere meaning "to trust" and is a huge element of religion. It makes sense that parents would want to give their daughters sure a virtue as a name. It has been in use sine the 1880s, but it wasn't until recently that Faith gained popularity as a first name. It peaked in 2002 at #48 and as of 2014, it ranked at #81. As a middle name, it could be even more popular but it is hard to be certain. Within our limited data here, it ranks well at #8. (8 uses) John is the 2nd most-used boy name of the last 100 years, and has been vastly more popular when you account for history and international variations. Jane is one of the female forms of John. There are many including Janice, Johanna, Ivana, Siobhán, Gianna and more. Jane/Jayne itself comes from Jehanne which comes from Iohannes, along with John. Iohannes comes from Yochanan meaning "YAHWEH is gracious" which is the name of the Hebrew God. Jane has always ranked in the Top 500, peaking in the late 1940s at #35. Her popularity as a first name waned after that. In 2014, Jane ranked at #322. Jayne has never been as popular, only gaining usage in 1906. It ranked in the Top 1000 from 1912 to 1973, but now ranks down at #2225 in 2014 with 84 births. Which do you prefer, Jane or Jayne? First name or middle? (8 uses) Jean is Jane's twin sister. Both names are the Medieval English form of Jehanne, which as we mentioned above, is related to Iohannes and the Hebrew Name Yochanan meaning "YAHWEH is gracious". Jean has been commonly used in England and Scotland since the Middle Ages. Pronounced JEEN, this name is not to be confused for the masculine, French name Jean pronounced ZHAWN, however they are related. Jean has always been used for both genders since 1880. It peaked in popularity as a first name for girls in the late 1920s at #12. It left the Top 1000 in 1995 and only received 74 births in 2014. Do you think it fares better as a middle name these days? (7 uses) Fay, Faye and Fae are all derived from the Middle English faie which means "fairy". It has been also used as a short form of Faith. As a first name, Faye ranked within the Top 1000 from 1880-1979 before losing steam. It sank pretty low for a while but has been reclimbing the charts, even ranking at #908 in 2014. Fae was sometimes used from the 1890s to the 1960s but nearly disappeared until recently. However, it only received 21 births in 2014. Fay only got 33. Faye is the most-used spelling. Do you know any girls with Faye as a middle name? (7 uses) Leigh is sometimes considered the feminine form of Lee, but both names are unisex surname names that come from the Old English leah meaning "clearing". Lee and Leigh work well as a first, a middle or a last name for both genders which is a somewhat unusual feat for a name. Lee for a boy is most popular of them all. Leigh wasn't even used for girls until 1912, but it had been around for boys since 1882. Plenty of women were named Lee through the 1950s-60s, but as of 2014, only 23 girls received the name. In the same year, 55 girls and 8 boys were named Leigh, and 348 boys were named Lee for a rank of #701. Which spelling do you like best for which gender? First or middle name? (7 uses) Nicole is the feminine French form of Nicholas which comes from the Greek name Nikolaos meaning "victory of the people". Nichole is a variant of Nicole and not nearly as common with only 139 female births in 2014. Interestingly, Nicole wasn't used in the US until 1937. It suddenly boomed in the late 1960s, climbing as high as #6 in 1982. It has fallen since then to #129 in 2014. Some people may feel as though it's dated to the 70s and 80s because of its high popularity. Does it still work as a first name today or is it better off as a middle? (7 uses) Rae is often thought of as the feminine form of the masculine Ray, but it is also a short form of Rachel. When derived from Rachel, it means "ewe", but when it's taken from Ray or Raymond, it could refer to a beam of light or be derived from a German element meaning "advice". If Star Wars' new heroine's name gets a boost, which is spelled Rey, then it would have the meaning "king" from the Latin rex or regis. This is take-your-pick kind of name. Obviously Ray has always ranked well for boys, but for girls, it has been spotty since the mid-90s when Rae seemingly took over. In 2014, 9 girls were named Ray while 87 were named Rae. We'll have to see if Rey pops up in 2015. All of these, though seem to be more popular as middle names. (7 uses) People love short middle names that start with R. We just saw Rae, now let's add the N sound to the end and toss in some nature. This unisex name simply comes from the English word rain referring to the precipitation. It comes from the Old English regn. However, you can't count out the possible regal angle that could be intended with spellings like Reign. Raine could be based on the French reine meaning "queen", just as Rey above refers to a king. Or perhaps these could be short forms of Lorraine, a region in France. Many possibilities are at play here. Most of these are all uncommon as first names. There were only 102 girls named Rain in 2014, and 92 named Raine, but there were 258 named Rayne which ranked it just short of the Top 1000. (7 uses) Just like the last two, Renee and Renae are well-used because they work well with a lot of first names. The origin of these names is Renatus which is a late Latin name meaning "born again". It lead to the French male name René, of which the Renée is the female form. Without the accent mark, Renee and Renae are the English forms. There's also the related Renata. As a first name, none of these are hot right now. Renee peaked in 1962 so it's plausible that girls today receive Renee as a middle name in honor of their grandmothers. Renee was in the Top 100 from 1959 to the early 1980s but has been gradually declining since then. In 2014, it ranked at #962 so it may not rank in the Top 1000 by 2015. Renae only had 55 births in 2014 and has never been as popular. (7 uses) It makes sense the the former #1 girls' name would also make for a great middle name. It is a Greek name meaning "wisdom". The phrase Hagia Sophia, meaning 'Holy Wisdom" was the name of a large basilica in Constantinople. This name was common through the Middle Ages with European royalty. It became popular in Britain when the German House of Hanover took power in the 18th century. As a name, Sophia does have international appeal with translations such as Sofia, Sofiya, Sonja, Žofie, Sonia, Szonja and more. Sophie is also a popular option that ranked at #91 in 2014. Of course, Sophia was #3 after three years at #1, and Sofia ranked at #12. Which do you prefer as a first? As a middle? (6 uses) The name and the word Joy come from the Norman French word joie which came from the Latin gaudia. As a first name in the US, it has been in use since 1885. It has ranked rather well over the years, especially from the late 1920s through the mid-1980s, peaking in 1957 and 1974. In 2014, it ranked at #462 for girls. Joy has also always been giving to boys, but only in handfuls per year. There were 23 boys named Joy in 2014. Do you think Joy is better as a first name or a middle name? (6 uses) This is the French, feminine form of the male name Louis which comes from Ludovicus, the Latinized form of the German Ludwig which comes from Chlodovech. Tha tname is composed of the elements hlud meaning "famous" and wig meaning "war". Other female diminutives include Louella, Lula and Lovisa. Louise itself seems to be used more as a middle name than a first name. It's a name that is heard often, but surprisingly hasn't ranked within the Top 1000 since 1991. Louise was most popular in 1918 and declined in usage after that. Only 199 girls received the name in 2014. However, for the first time since 1969, sister-name Louisa did rank at #973. Could Louise join the Top 1000 soon, too? (5 uses) Michelle is the French feminine form of the male name Michel which is the French form of Michael. Michael comes from the Hebrew name Mikha'el meaning "who is like God?" From Michelle also come names like Micheline and international versions like Michaela, Mikaela, Michalina, Miguela and Mykhaila. As a first name, Michelle wasn't used in the US until 1915. It entered the Top 100 in 1954 and ranke as high as #2 in the late 1960s to early 1970s. Then it declined, falling out of the Top 100 in 2008. As of 2014, it ranks at #187. What do you think of Michelle as a first and as a middle name? Does this list seem somewhat accurate to you or do you think there are other middle names that might be more popular than the ones listed above? There are definitely more names out there that might have deserved a spot above. For example, other middle names that appeared frequently within The Art of Naming's birth announcements but didn't make the cut for this list include Christine, Catherine/Katherine/Kate, Caroline, Charlotte, Alexandra/Alexandria/Alessandra, Victoria, Ruth, and Josephine. Beyond these names mentioned above, anything else that you choose for a middle name will probably not be quite as commonly used, however, since this data is very limited, there are surely names more or less popular in specific locations. Other middle names that could be added in as "modestly popular" may include Abigail, Belle, Beth, Brooke, Claire, Dawn, Elaine, Elise, Evangeline, Evelyn, Frances, Jo, Juliet/Juliette, June, Kay, Lane, Lillian, Madeline, Margaret, Noelle, Olivia, Pearl, Skye, Taylor, Violet, Virginia, and Vivian/Vivienne. So tell me, which middle names do you hear most often for girls in your area?